Sinéad O'Connor Announces Conversion To Islam, Assuming New Name The iconic Irish singer, now known as Shuhada' Davitt, proclaimed herself a Muslim on Thursday. The Irish singer now known as Shuhada' Davitt — formerly Sinéad O'Connor. 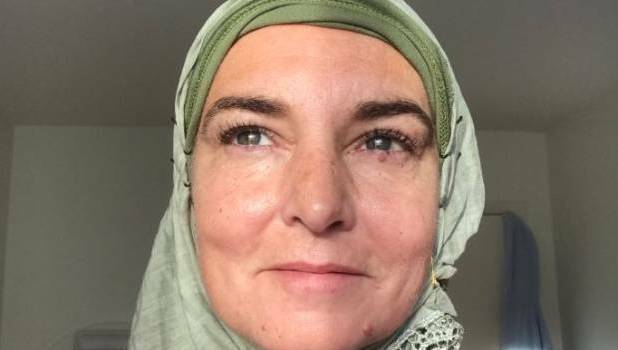 The singer formerly known as Sinéad O'Connor, and most recently named Magda Davitt, has converted to Islam. She is now using the name Shuhada' Davitt. She has written on Twitter that she is "very, very, very happy" and is giving thanks to "all my Muslim brothers and sisters who have been so kind as to welcome me to Ummah," referring to the Muslim community worldwide. Shaykh Umar Al-Qadri, the head imam and theologian of Islamic Centre Ireland and chair of the Irish Muslim Peace and Integration Council [IMPIC], posted on Twitter that Davitt had said the shahada — the Muslim profession of faith ("There is no god but God, and Muhammad is his messenger") — with him. Proclaiming the shahada is the act of converting to Islam. Davitt announced her conversion on Thursday; on Oct. 20, she posted a video of herself performing the Muslim call to prayer, the adhan (also known as azan or athan), saying: "I got some pronouncition [sic] wrong because emotions took me from my page... but there'll be hundreds of others onstage to come ..."
In a press release, the IMPIC underscored the idea that Davitt had taken the step thoughtfully: "Her coming to Islam has been a careful and informed decision and follows a lifetime of searching and study ... At this early stage, she has asked for her privacy to be respected so she can focus on her own spiritual well-being." Al-Qadri said in the statement, "Shuhada has faced many challenges in her life. Where there is light, darkness has tried to envelope it, the greater the light, the greater the struggle with darkness." She then went on the Dr. Phil show to talk about her challenges, saying: "I'm hoping we can save some lives. There's a certain group of people who are absolutely afraid to open their mouth about mental illness — and that is rockers. People in the music business. Famous people. I think it's important that those of us that are in the entertainment industry actually do begin to open up." On Dr. Phil, the singer also spoke about her early life, alleging that her mother physically and sexually abused her. Last year, she announced that she was legally changing her name to Magda Davitt, writing: "Sinéad is dead. And a happier woman has been born. Free of the patriarchal slave names. Free of the parental curses." The name Shuhada can be translated as "martyrs" or "ones who bear witness"; Davitt has apparently chosen to add an apostrophe to the end of the name. In a series of recent tweets, she shared images of herself wearing a hijab, explored a few aspects of Muslim theology and quoted a verse from the Quran: "So how will it be for you when we bring from every nation a witness?" Many Muslims and others on social media have greeted the news of her conversion warmly, though others already have criticized her for reciting the adhan as a woman. And there are some posting anti-Muslim remarks or positing that it's just another phase for a woman who already has morphed through several personal and religious identities. In response to her conversion to Islam, others just want nothing more than to be rescued from the inevitable hot takes. Guardian columnist Nesrine Malik wrote: "If there is a God please have mercy on us from the Sinéad O'Connor conversion hot takes. Kill them in their infancy, smite them in the seed, strengthen the resolve of editors we pray to you ameen."